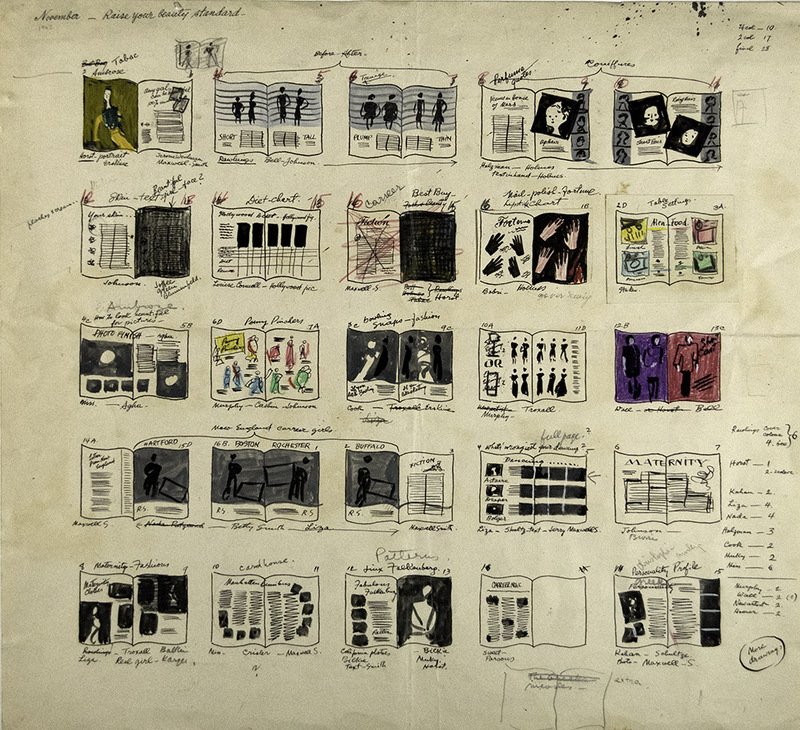 The story of Cipe Pineles, with images from the extraordinary archive of her work, pictures, and manuscripts at RIT’s Cary Graphic Design Archive. There is a resurgence of craft, as a generation of industrious folks are YouTubing their way into niche careers, capitalizing on their uniqueness and creating brands for themselves. What if art directors used the same concept to get their product out? Quickly rolling up shirtsleeves to whip out custom designs with their own illustrations and lettering, not only meeting the publication deadline, but surpassing expectations in the process? A pioneering mid-century designer did just that. Cipe Pineles was her name and she led a remarkable typographic life. 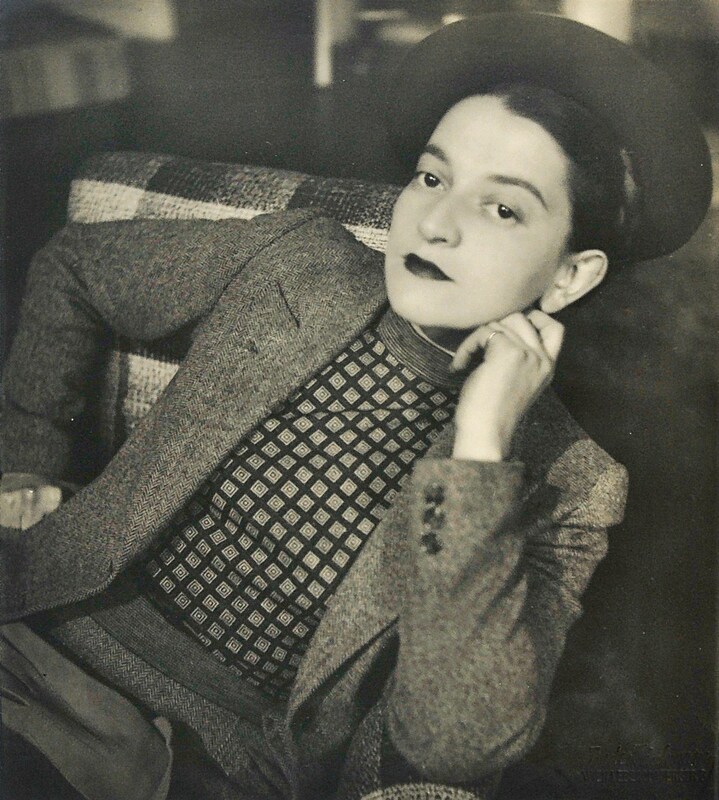 Cipe Pineles (1908-1991) moved to New York from Vienna in 1923 with her family. In her childhood she developed artistic skills that sailed her through art school, eventually landing an assistantship with the great M.F. Agha at Condé Nast in 1932, working on Vogue and Vanity Fair magazines. Dr. Agha, almost forgotten today, was the most influential magazine designer in the United States from the 30s through the 50s. His management style was that of the Great Master, later emulated by Alexander Liberman. Cipe carried none of this baggage. Her creative and collaborative spirit set her on a trajectory for making milestones: Art director at Glamour magazine in 1942; the first woman art director of a major magazine for the burgeoning teen market at Seventeen from 1947 to 1950; the first woman to be inducted into the Art Director’s Club in 1948; and art directorships at Charm and Mademoiselle from 1950 to 1961. Cipe was a leading woman in design when almost all her counterparts were men. Her facility in choosing the appropriate typeface or lettering style would serve her well throughout her career. A magazine designer’s challenge is to create a cohesive flow of disparate information from spread to spread. Pineles’ layout plans for single issues are models not only for sequencing and the balance of type and image, but also for the craftsmanship of lettering and sketching. 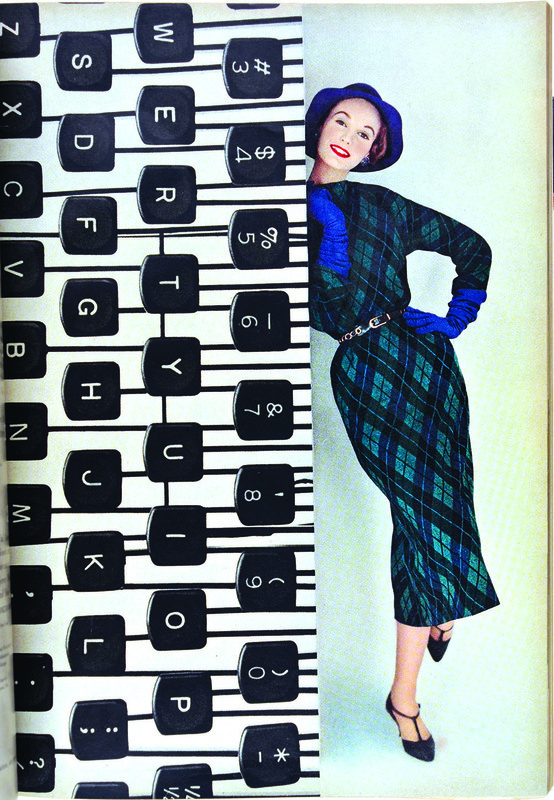 Several examples of her layouts as art director at Glamour (1942-1946) are in her archive at the Cary Graphic Design Archive at Rochester Institute of Technology. The cover from the November 1942 issue shows her innovative combination of cut-paper letterforms combined with photography and hand-lettering. While inside, the jelly bean pink and violet spread in print is almost as she imagined it in her gouache sketch: a handwritten headline placed on a diagonal with a triptych of fashion illustrations. This kind of precise visual direction to the illustrators, photographers, and typesettters working on Cipe’s team must have been invaluable in creating a consistent feel for each issue. 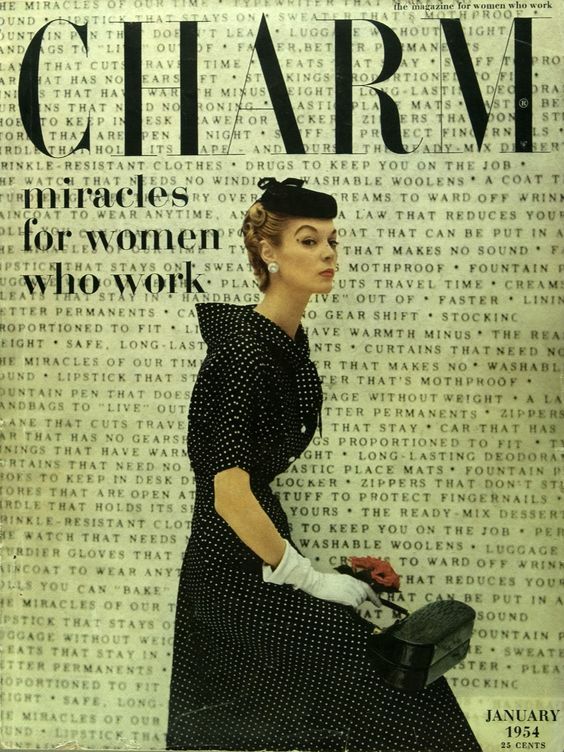 Cipe Pineles’ tenure as art director at Charm from 1950 to 1959 is marked by sleek modernist typography and elegant fashion photography. This allusion to sophistication attracted its audience of young urban women who were working for a living—“between school and marriage.” The cover from January 1954 shows a chic gal poised against a background of monospaced words. Her flawless composure is enough to eclipse her everyday concerns: “wrinkle-resistant clothes, “drugs to keep you on the job,” “protecting fingernails,” “mothproof,” “lipstick,” “zippers. . .” How could one resist buying the magazine to see if it indeed held all the answers to those “miracles for women who work!” Pineles repeatedly won awards from AIGA and the Art Director’s Club for her creative work on Charm. Cipe’s archive at RIT overflows with pasteups, proofs, tear sheets, and final copies of printed work she designed. We can learn much from her process—the multiple, painstaking versions of lettering, paintings in various states of completion, and sketches in all media. This creative product provides a breadcrumb trail of ideation and problem-solving that every practicing artist should see. An example of this is her successive hand-drawn letterhead layouts for Green Mansions, a resort in the upstate New York Adirondacks, where she worked as a freelance designer into the 1960s. Each drawing is a patient exercise in the refinement of typographic form, well before the instantaneous digital cut-andpaste practice of today. After leaving the magazine industry in 1961, Cipe entered a long-time relationship at Parson’s School of Design, as designer and teacher. 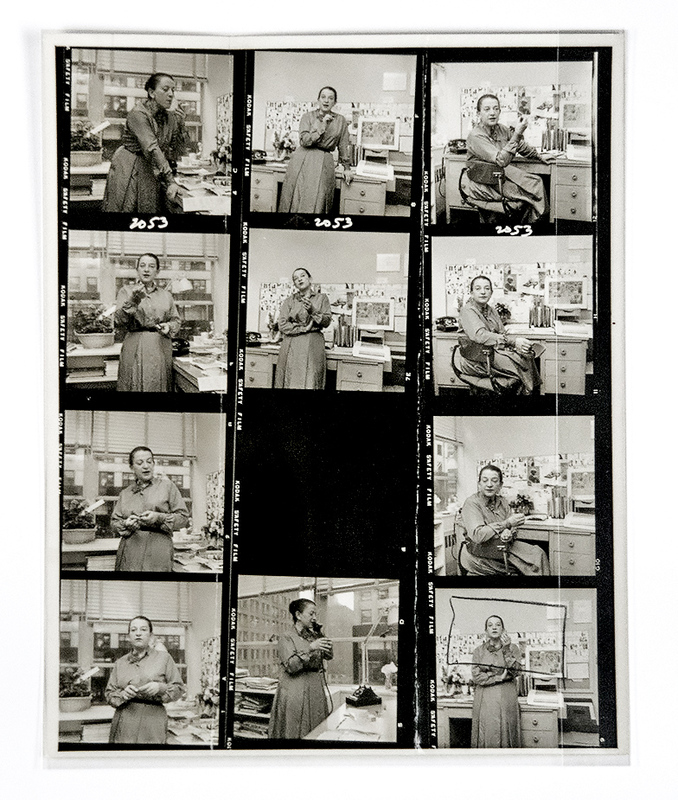 She mentored a generation of students in the 60s and 70s, a time of changing production workflows as photo- typesetting and offset lithography were supplanting letterpress. A glimpse at her process use of substrates of vellum overlays, photostat proofs, and type samples on film. Her work on the Parson’s diploma even incorporated some computer-generated typography, as mylar proofs by “Tom Carnase Computer Typography” are included in the archive. It does not, however, neglect her facility for lettering by hand. Her personal aesthetic seemed to incorporate it without the certain showiness and precision evident in many of today’s lettering styles. A “comp layout” for the cover of Vogue, 1939. Lettering for Glamour, 1942. At the end of Cipe Pineles’ career, she was celebrated in the design world. Her work is chronicled in several publications, notably Martha Scotford’s monograph, Cipe Pineles: A Life of Design, 1999, and a 2002 chapbook, Cipe Pineles: Two Remembrances. As trends ebb and flow, it is no surprise that she was “rediscovered” last year in Leave Me Alone with the Recipes: The Life, Art, and Cookbook of Cipe Pineles. This bestseller is a tribute to Pineles’ gift for illustration, with salutes by contemporary creatives, including Steven Heller and Maira Kalman. Print magazine featured her in a retrospective article in 1985 with some 70 reproductions of work from her five decades in practice. Her illustration on the cover of the issue is a colorful mix of still life objects. Scrawly blackletter and modern roman letterforms adorn the porcelain ware at the center of the painting. Stencil type sits on the word tiles at the bottom of the page, reflected by sturdy transitional letters on the building blocks at the top. These myriad objects are a fitting summary of her typographic experience to which she added the enjoyment of food, and nature, as well as a lifetime of collecting, and in short, living to her fullest. Amelia Hugill-Fontanel (associate curator of RIT’s Cary Graphic Arts Archive) brought us the extraordinary trove of Cipe Pineles’s work.